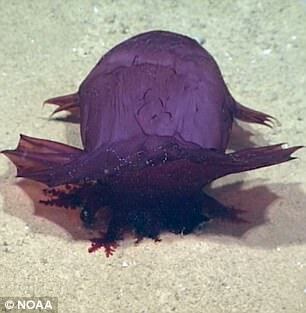 Some of the world’s most unusual creatures can be found at the dark depths of the ocean floor. 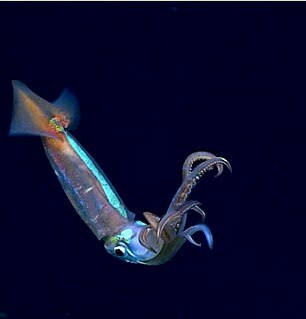 And, lurking in the Gulf of Mexico, NOAA researchers have spotted what could be the strangest yet. 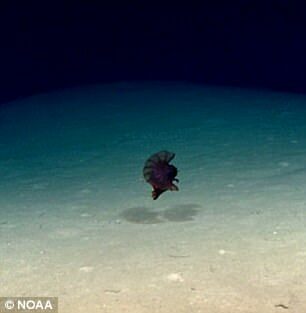 The so-called headless chicken monster, a sea cucumber called Enypniastes eximia, was spotted during Dive 11 of the NOAA Okeanos mission in the Gulf of Mexico. And, it’s far from being the only strange creature the researchers observed. 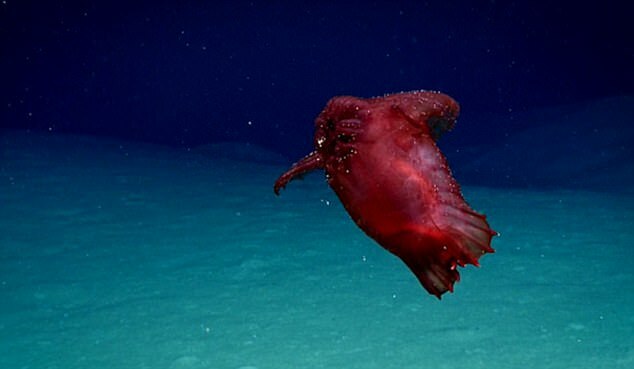 Incredible footage of the bizarre red cucumber shows how it ‘walks’ across the surface of the seafloor to feast on the sediments, using tentacles that roll out from underneath its body like feet. 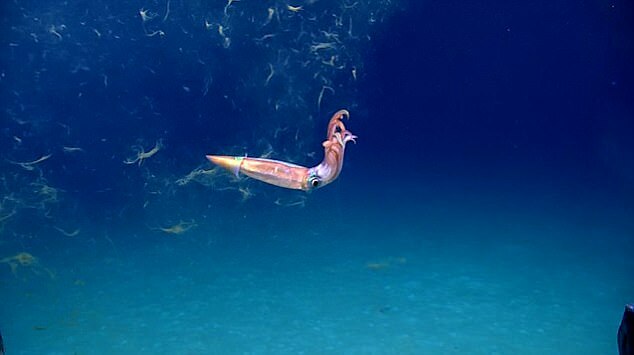 ‘These tentacles, which are modified tube feet, scoop in the sediment, and they are only taking in materials from the surface of the sediment, which is higher in organic material,’ one of the researchers explains in the footage of the encounter. The Gulf of Mexico dives that wrapped up this month is the first of three planned for the region, according to the NOAA. The ship will conduct 24-hour operations, with ROV dives during the day and mapping operations at night. ‘This expedition will help to establish baseline information in the region to catalyze further exploration, research, and management activities,’ NOAA says. The next two cruises are set to launch in spring 2018. Undulating through the water or slowly crawling across the floor, the strange sea cucumber at first appears graceful. But, when viewed from a different angle, it takes on a much more sinister appearance. 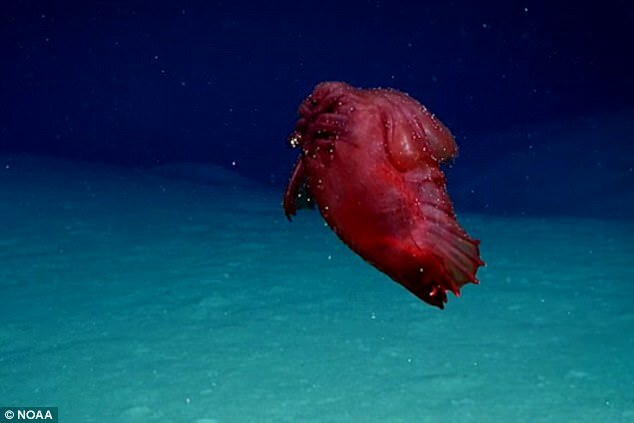 In one clip from the footage, the blood-red creature looks as though it has wings and the equivalent of tail feathers – and, the wrinkled nub at the top of its body looks like the site where its head should have been. 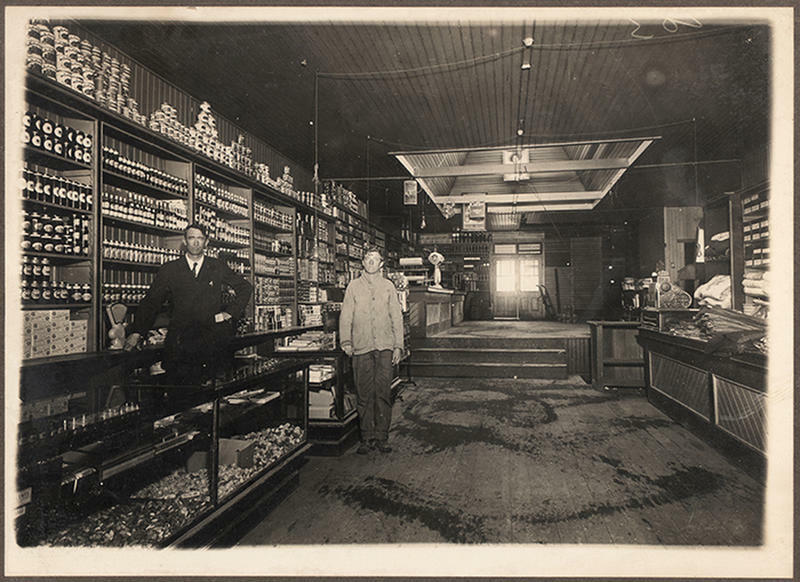 As a result, it’s earned a number of names apart from its scientific moniker. 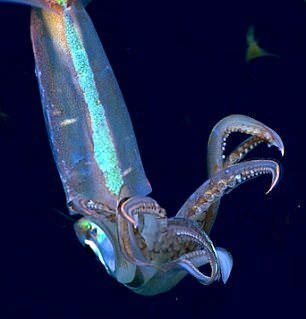 In a subsequent dive, the team also spotted a remarkable iridescent squid, known as the shortfin squid. ‘This was likely a defensive strategy; it’s likely meant to distract any predators or perhaps even blind them and give them a cover to run under,’ the researchers note. 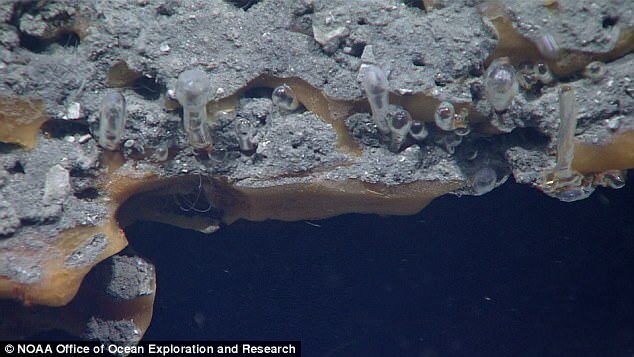 They also observed strange creatures known as ice worms living on methane hydrate outcrops. ‘The worms can live in communities as dense as 3,000 individuals per square meter,’ according to the researchers. These strange pink worms graze on bacteria on the hydrate.